As the kids flew high over the Dollar Mountain terrain park this Thanksgiving weekend, the winter issue of the Sun Valley Guide hit the streets. Featuring a skier defying gravity over one of Sun Valley Resort's two original ski hills on its cover, the magazine celebrates the resort's 75th birthday by looking into its past and imagining its future. "The Count of Sun Valley" tells the tragic story of the resort's forgotten discoverer, Count Felix Schaffgotsch. Revealing some startling facts about the Austrian nobleman, including his passion for Hitler and his bloody death on the Russian front, the article provides the first comprehensive portrait of the man who found Averell Harriman his valley in the sun. Idaho Mountain Express Editor Gregory Foley spends a night in Glamour House, bringing to life the story of how Ernest Hemingway created "For Whom the Bell Tolls" in Sun Valley. Leaping forward, in "Visions of Sun Valley: 2086" Rebecca Meany asks community leaders to look into their crystal balls and reveal what they see in the valley's future, 75 years from today. Back in the present, Robin Sias takes a trip into the backcountry with a group of women who have embraced the call of the wild. Pick up a free copy of the Sun Valley Guide today at locations throughout the valley or call 726-8060 for a copy. 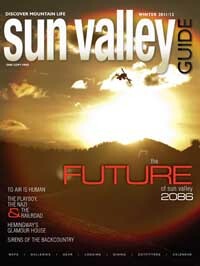 The magazine is also available online at www.sunvalleyguide.com.